A brilliant mural on the wall says “Black on Black Love” and quotes Dr. Martin Luther King Jr.: “An injustice anywhere is a threat to justice everywhere.” On the floor, a square of bright kente cloth holds decorative rocks, incense, magic markers, and post-it notes. The atmosphere is warm, calming, and welcoming. In other words, it is very different than the image that usually comes to mind when one thinks of court. But this is home to the North Lawndale Restorative Justice Community Court, a bold experiment that has garnered national attention and the backing of the Cook County court system. 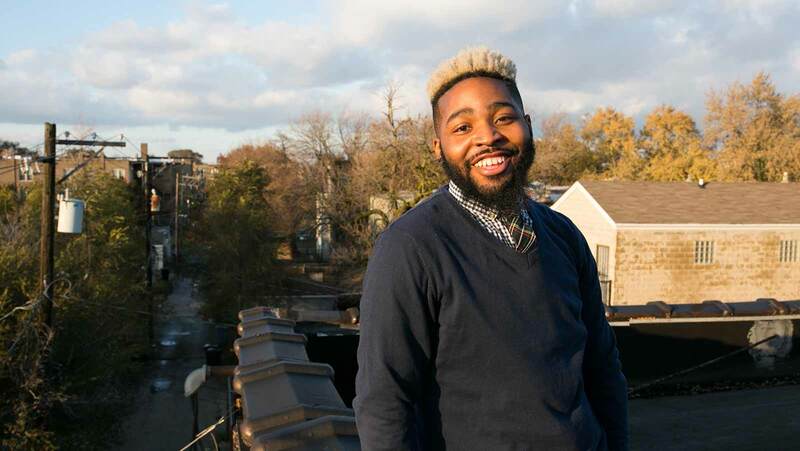 The lead facilitator, or “circle keeper,” of the court is Jeramey Winfield, a 26-year-old North Lawndale native who was introduced to the concept of restorative justice while at North Lawndale College Prep High School. He now sees it as a way to nurture his community and build on its assets while addressing the drug trade and violence that have affected many residents, including his own family. Restorative justice is based on the idea that crime and wrongdoing are an offense against an individual or community rather than the state. Therefore, when someone has committed a crime or misdeed, rather than punishing the person in the traditional court and correctional system, anyone harmed by their actions, including surrounding community members, come together to discuss the incident and decide how the person can make amends and be held accountable, while also figuring out how to support that person and ensure he or she will not fall back into the same behavior. A decade ago at North Lawndale College Prep, Winfield participated in peer restorative justice circles used in place of suspension or other punishments. Winfield went on to study communications at Colby-Sawyer College in New Hampshire, but always knew he wanted to come back to North Lawndale and work in his community. During college breaks, he got a job facilitating restorative justice proceedings and substitute teaching at the high school. And not long after graduating, he was hired by the Lawndale Christian Legal Center, which administers the restorative justice court out of the Lawndale Christian Community Church with a grant from the U.S. Department of Justice. North Lawndale, on Chicago’s West Side, had the third highest violent crime rate of the city’s 77 community areas, according to a recent analysis by the Chicago Tribune, and 43 percent of residents live below the poverty line. The population is 91 percent African American, and like many West Side areas, North Lawndale is still suffering the economic consequences of disinvestment and unscrupulous real estate practices related to “white flight” a half-century ago. Despite the challenges, Winfield has warm memories of growing up in North Lawndale, including going to the park with his family on the Fourth of July, he and his four siblings wearing matching outfits. But the West Side’s notorious violence dealt a devastating blow to his family, particularly during a brief stay in the Austin neighborhood adjacent to North Lawndale. Jeramey’s younger brother, Jermaine Winfield, was a star basketball player in high school. Everyone expected he would play Division I college ball after he worked out some academic issues with a stint at a community college in Texas. On June 28, 2011, Jeramey and a friend were cooking his favorite breakfast foods – grits, pancakes, eggs – even though it was nighttime. Jermaine, who had recently returned from Texas, poked his head in and joked that he wanted breakfast, too; Jeramey promised he could have some later that night. Soon after Jermaine left, they heard a series of loud cracking sounds. Jeramey took them for fireworks. But a neighbor told them Jermaine had been shot. He was in a coma for about a week, and as he came out of it, doctors informed the family he was paralyzed from the chest down. Jermaine struggled for many months with depression, “shades pulled down, curtains closed, no TV, no nothing, just laying under his covers,” Jeramey remembers. The family saw the shooting as part of a complicated cycle of retaliation, and just a few years later, Jermaine was shot again while riding in a car, Jeramey said. Restorative justice work is aimed at breaking such cycles before they escalate, and so eventually Jeramey recruited Jermaine to join him in the restorative justice field, sharing his own story with local youth. The Restorative Justice Community Court, which officially launched in the summer of 2017, is open to North Lawndale residents ages 18 to 26 who are accused of non-violent offenses. If the Cook County State’s Attorney’s office deems someone eligible for the court and if the defendant wants to participate, the agreement is formalized with Judge Colleen Sheehan, who oversees the court for the county. Winfield and his partners take it from there. After an initial preparatory session, Winfield convenes a restorative justice circle, gathered around the kente cloth in the community church. It includes the defendant, the victim or someone who represents the harm done to the community, several allies of the defendant, the circle keeper (often Winfield), and potentially other community members, as well. During the circles, an agreement is drafted, which usually calls for the defendant to access resources such as GED classes or job training and to make amends for their actions. If they follow through with the plan, the case is dropped, and they avoid criminal prosecution. By Thanksgiving, there were approximately 25 cases that had gone or were going through the court, and Winfield said that number is expected only to increase. While the court in and of itself is an ambitious undertaking, Winfield sees it as just one piece of a larger push for healing, community empowerment, and autonomy in North Lawndale. “…[I]t’s getting to the point where we can be self-sufficient amongst ourselves and resolve community issues without the assistance of systems,” Winfield says. There are already numerous, dovetailing efforts underway in the community. They include the MAC House, run by the Lawndale Christian Legal Center, which provides housing and job skills to people coming out of the criminal justice system; North Lawndale Employment Network, which connects people with training and jobs for careers including automotive technology, culinary arts, and cleaning services; the Firehouse Community Arts Center, teaching hip hop and more in a once-vacant firehouse; the UCAN social service and violence prevention agency; the Young Men’s Education Network (YMEN); and Phoenix Hall, providing apartments for teens at risk of homelessness. An annual, popular Route 66 classic car show in North Lawndale brings several of these organizations together and doubles as an exchange of community resources, with booths promoting jobs, health screenings, and other services. Every second Tuesday of the month at St. Agatha’s Catholic Church in North Lawndale, people come together for a meal cooked by a young local chef and entrepreneur, then break into several “peace circles,” similar to the restorative justice circles. The group includes parishioners of St. Agatha’s and of Old St. Patrick’s Catholic Church in the River West neighborhood. Old St. Pat’s is joined with North Lawndale in a project called the North Lawndale Kinship Initiative, wherein Old St. Pat’s parishioners follow the initiative of local leaders by supporting them in coordinating events and launching various projects, recently including a local athletic association. “We decided to identify a neighborhood where we could focus our outreach, not just be servants but know peoples’ dreams and hopes and walk with them,” said Vincent Guider, director of the Kinship Initiative. The peace circles at St. Agatha’s provide a powerful forum for people of different ages, races, and backgrounds to talk about difficult topics, such as racism, prejudice, and current, polarized politics. Participants hope the circles at St. Agatha’s can also serve as a training ground for residents to become part of the restorative justice court circles and get involved in other burgeoning local initiatives.